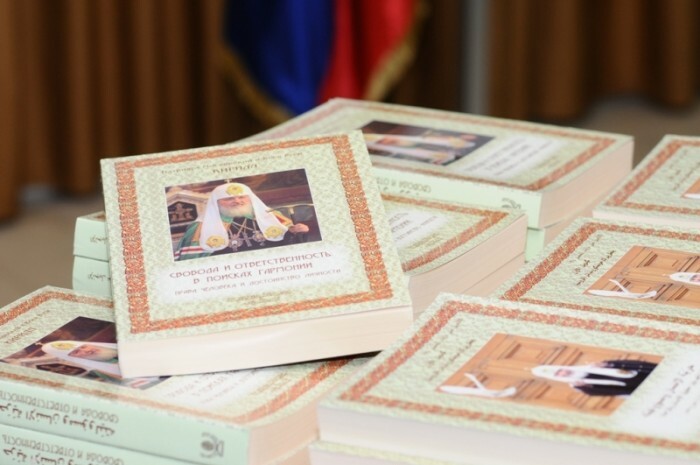 December 5, 2012 – An Arabic version of the book ‘Freedom and Responsibility: In a Search for Harmony’ by His Holiness Patriarch Kirill of Moscow and All Russia was presented at the Russian Science and Culture Center in Beirut. The presentation was organized by the Lebanon representation of Russia’s Federal Agency for International Cooperation together with the Lebanon-Russia House and the Center of Levantine Christians. It was attended by Archpriest Anatoly Yegorov, rector of the Russian Parish of St. John the Baptist in Beirut, Lebanese religious and academic leaders, Russians living in Lebanon and Lebanese journalists. The gathering began with a minute of silence over the death of His Beatitude Patriarch Ignatius IV of Great Antioch and All the East, who died that day. Then Russia’s Ambassador A. Zasypkin made a speech, thanking those Lebanese who initiated the translation of Patriarch Kirill’s book. He also pointed to the importance of the Patriarch’s statements about harmony and love of the neighbour, freedom, responsibility and humanistic values for the Middle East and the whole world. Dr. Kamil Moubarak, president of the Lebanese Wisdom University, spoke about particular theological aspects of Patriarch Kirill’s book. Participants in the event had an opportunity to see a photo-exhibition ‘Orthodox Russia’ and receive a copy of Patriarch Kirill’s book published in bilingual, Russian and Arabic, format. It was already the second Arabic version of the book. The first one was presented on November 13, 2011, in Damascus and November 15, 2011 in the Balamand University, during Patriarch Kirill’s visit to the Patriarchate of Antioch.